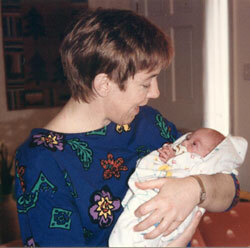 I remember holding Christopher for hours after he came home from 61 days in the NICU. He was just 4 pounds and light as a feather, and I wanted to make up for the lost cuddling during all those days and nights on tubes, oxygen, etc. I remember calling him Bright Eyes because his big blue eyes followed my every move. Soon after he came home, we started our many “follow-up” appointments. Almost every day we needed to be somewhere, or someone needed to be at our home. In his first year, we had over 90 medical appointments—nearly 2 per week—and took part in weekly physical therapy, speech therapy (feeding, swallowing), and a parent support group. My head was sometimes spinning from lack of sleep and all the normal excitement and caring that comes with a new baby. When he became colicky, I really wanted information. The colic seemed to last forever, although in fact it lasted only 2 months. Christopher was a very slow grower, had surgeries facing him, and doctors who asked me if he was a FTT (failure-to-thrive) baby. I didn’t believe so, wanted to cry, did cry, and then I wanted advice and information. During the NICU weeks, I had read and reread The Premature Baby Book to prepare myself for issues that very small and early babies and their families face. That was helpful, but what could I read or watch when he was 6 months, 12 months, 24 months? I loved Christopher just the way he was, but I also knew he needed extra help and I needed information. I just cope better if I can “have the facts.” Some people call it bibliotherapy—I call it getting ready for today and tomorrow. I was lucky to have friends and therapists who could recommend resource books, videos, and magazines with stories about other parents with preemies. They gave me information, a sense of support, sometimes a good laugh, and other times great questions to ask his therapists or doctors. Now it’s all a bit of a blur, but we made it through those first 3 years. Christopher walked at 18 months and said mama just before that. He loved eating broccoli with his fingers and watching Barney. We had rough moments with many ear infections, which meant he had to take that pink medicine—some often ended up on the wall and on me. He reached new milestones, always a bit late, but I usually wasn’t counting. Like most moms, I cried when we left early intervention and he started his first day of preschool. Come to think of it, so did he! 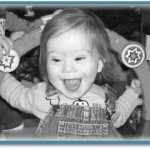 Christopher, now known as Chris, has had an IEP since preschool. Not everybody knows it because he’s fully included in his high school. And unbelievably, he’s almost old enough to drive. He struggles with some school work but not all, he likes some sports but not others, and he can be distractible. He’s like most of his buddies, a teenager who is not sure he wants anyone to know I’m his mom. And forget any efforts at physical displays of affection—a high five will do! I still read a lot, now about the changes that come with adolescence, how to structure homework for students with ADHD, but also about some of his favorite things: camping, paintballing, and skateboarding. My needs have changed and so have his. I know there are still some questions for the future. But I will always be grateful for the support and many resources I found to guide me and reassure me when he was tiny and fragile. I use those skills still today. I hope you’ll take advantage of the services offered by the Early Intervention Clearinghouse—we have a great variety of books, videos, and other materials. They range from stories to read to your children to information books on different conditions (chronic ear infections to language delays to autism). Call or email us. We’d also like to hear about your story, and we will have a section of the Web site with stories from parents recounting their days in EI or telling about their lives today in the midst of EI services. You aren’t alone—every year 20,000 families participate in EI services in Illinois. I’m on the other side by a dozen years now. Hard to imagine back then that Chris would be 5’5” and bicycling to his neighborhood high school. But he is.